Then-candidate Donald Trump is introduced by then-South Carolina Lt. Gov. Henry McMaster at a campaign rally in Florence, S.C., in 2016. Now Trump is president and McMaster is governor and campaigning for a full term. Two of the things President Trump likes most are winning and loyalty, and both have clearly been on his mind as he's doled out prized political endorsements this year. For candidates this cycle in a Republican primary, winning Trump's endorsement is political gold. It can push them over the finish line in a tough race, and it gives the president a chance to claim credit for their victories and get some of the glory. But the president has had a mixed record of picking winners and losers since he took office. Attacking and taunting politicians he's deemed disloyal has worked in getting them knocked off in some cases, or in pressuring them not to run. And while Trump's endorsement is highly sought after in GOP primaries, it's also not a silver bullet. This Tuesday offers two tests of how much Trump's influence can truly boost a candidate after he endorsed South Carolina Gov. Henry McMaster and New York Rep. Dan Donovan in their primary fights. In South Carolina, Trump is going all in for McMaster, who was the first statewide-elected official to endorse his 2016 presidential bid back when Trump was largely a political pariah among Republican officeholders. McMaster was promoted from lieutenant governor when Trump selected then-Gov. Nikki Haley to be his ambassador to the United Nations, and now McMaster finds himself in a runoff against wealthy businessman John Warren. Trump is appearing at a rally in Columbia for McMaster on Monday, and Vice President Pence also campaigned for him over the weekend. Trump has also frequently tweeted in support of McMaster, writing on Friday that he's a "truly fine man." In past tweets, he's praised him as someone who's "strong on Crime and Borders, great for our Military and our Vets." 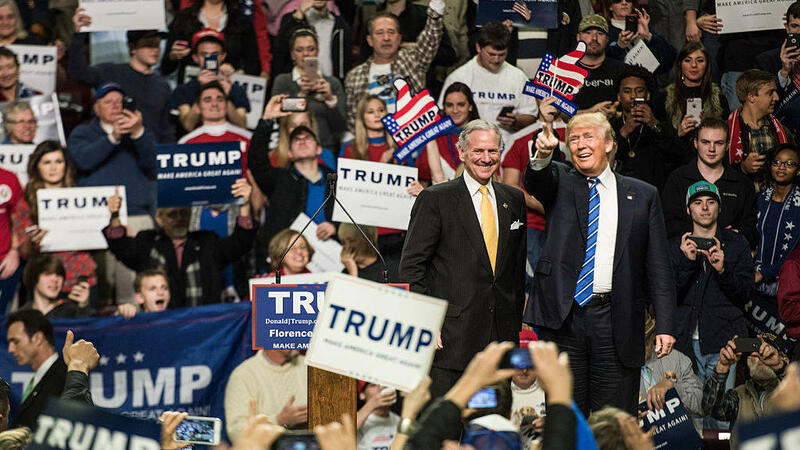 McMaster's support for Trump from the very beginning, when few others were willing to back him, makes McMaster a worthy candidate for a campaign event, argued South Carolina GOP consultant Chip Felkel. "McMaster has certainly earned an enthusiastic reminder of his loyalty to the president." Initially Felkel and others in South Carolina were skeptical of whether Trump would come in person, because the governor's victory is no sure thing. McMaster got 42 percent of the vote two weeks ago in the five-way primary, and may have trouble increasing his share much beyond that. His rival, Warren, has been arguing he's the candidate more closely aligned to Trump — an outsider businessman who would shake up the political system, as opposed to McMaster, who's held elective office in the state for much of the past 15 years. But Trump and Pence's visits to the state shows that the president is willing to go beyond his Twitter feed to show support for a like-minded candidate. If McMaster pulls off a victory, Trump can claim the surge was his doing. But if he doesn't, it would saddle Trump with another loss on his mixed record so far during his term. That's what happened in last year's Alabama special election for U.S. Senate. First, Trump endorsed appointed Sen. Luther Strange (who replaced now-Attorney General Jeff Sessions) in the primary, over the objections of some of his most vocal supporters. Trump also traveled to Alabama to hold a rally for Strange, but it wasn't enough — former state Supreme Court Chief Justice Roy Moore prevailed and Trump switched his support to the GOP's nominee. After multiple women accused Moore of sexual misconduct from when they were teenagers decades ago, Trump stood behind Moore. Although Trump didn't hold a rally for Moore, he did add a campaign stop across the border in Pensacola, Fla., just before Election Day. Ultimately, Moore lost to Democrat Doug Jones. Trump also campaigned for Republican Rick Saccone in a Pennsylvania U.S. House special election March, which Democrat Conor Lamb went on to win. Later, both Trump and other national Republicans blamed Saccone for being a weak candidate. In comparison to McMaster, the president has taken a more hands-off approach with Donovan ahead of Tuesday. The incumbent is facing a vigorous primary challenge from former U.S. Rep. Michael Grimm, who is attempting to mount a comeback after pleading guilty to tax evasion charges and serving seven months in federal prison. Part of Grimm's case against Donovan has been that the incumbent isn't supportive enough of Trump. Grimm's argument was drowned out somewhat when Trump tweeted an endorsement of Donovan last month, writing that the congressman "is helping me to Make America Great Again." Most important, Donovan's allies say, was Trump's follow-up tweet saying that Grimm would be unelectable in a general election, imploring voters to "Remember Alabama." GOP strategists worry that if Grimm wins, the seat will be much more likely to flip to Democrats than if Donovan is the nominee. Even without a visit from Trump, the president's tweets thrilled Donovan's supporters. "We saw a significant uptick of support when Trump did endorse Dan Donovan twice via tweet," said Sarah Chamberlain, president and CEO of the Republican Main Street Partnership, whose group is actively supporting Donovan. Fieldworkers from the group's political action committee reported talking with several people who switched their support to Donovan after Trump's endorsement. Ultimately, the primary race remains very tight and even Trump's blessing may not be enough. The president has broad support in Staten Island, the only New York borough he carried in 2016. But Trump hasn't campaigned for Donovan or invested as much of his time and energy as he has for McMaster. If Donovan loses, it won't be as much of a blemish for Trump than if the South Carolina governor is ousted. Charles Bullock, a political science professor at the University of Georgia who has studied campaign endorsements, said that while Republicans in safer GOP districts are clamoring for Trump's favor now, that probably won't continue into the general election, especially for candidates in swing districts. "He is helpful in a primary," Bullock said, "but it's something which might come back to bite you if he endorsed you in a marginal district that got you a nomination, but you might pay a price for it come November." Two weeks ago, Trump endorsed the challenger to a candidate who had spurned him — South Carolina Rep. Mark Sanford. The congressman's primary opponent, state Rep. Katie Arrington, had made Sanford's vocal criticism of the president the focus of her campaign against Sanford. Then, less than three hours before polls closed, Trump tweeted out his endorsement of Arrington. Trump's tweet let him exact revenge against Sanford and allowed him to boast he took down an enemy, even if it's debatable how much impact a tweet so late on Election Day could have had. At least some observers in South Carolina think the tweet helped Arrington defeat Sanford outright — without a runoff two weeks later, as most expected would happen, but others are skeptical it gave her much of a boost. The next victim of Trump's retribution could have been Alabama Rep. Martha Roby. She faces a politically perilous runoff next month after coming out against Trump in October 2016 when the Access Hollywood video surfaced, showing the president making vulgar remarks and bragging about groping and forcibly kissing women. But unlike Sanford, Roby has been contrite after initially criticizing Trump. On Friday, he gave her a somewhat surprising endorsement via Twitter. Alabama GOP pollster Brent Buchanan said that message from Trump was "huge" for Roby. "I would have said she was in a lot of danger because of what she'd said in the past about Trump, but now I think that with this narrative she's in a really good place," Buchanan said. "This moves a lot of things in her favor. Ask Katie Arrington how helpful tweets can be."